All it took was one visit to the beaches of southwest Florida for this Northeast transplant to begin a 40 year love affair with all things beach. 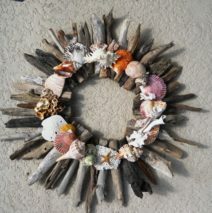 After all these years it was finally time to do something with my collection of beautiful shells, driftwood and other marine relics. Clean, uncluttered designs using mainly local materials highlight the beauty of nature’s gifts from the sea. No live shells or marine life have been used in my designs, and everything has been carefully cleaned and sanitized. Wreaths, candle holders, shell embellished plates and bowls, picture frames, shadow boxes, and wine corks are a few of the things available. I hope that you find something here that speaks to you of the peace, serenity, and beauty of nature. I am at the market on a part time basis, so you can email me to get my schedule. Hope to see you soon.